Page 2 SPACEPORT NEWSSept. 5, 2008Workforce Florida assists all during transition By Linda Herridge Spaceport NewsA Agreement with the Bre vard Workforce Develop ment Board (BWDB) will help to b olster support for Kennedy Space Centers work force during the tran sition from the Space Shuttle Pro gram to the Constellation Program. Also, Wyle Aerospace Group V ice President George Hauer was appointed to the Workforce Florida Inc. board of directors. Hauer is one of 27 new board members appointed by Governor Charlie Crist, and is the only board member from Kenne dy. Workforce Florida is the states c hief work force policy organization and principal architect in the efforts to meet Floridas current and future employment needs and challenges. It is an honor to be appointed t o the Workforce Florida board of directors, Hauer said. This ap pointment enables the aerospace w ork force in Brevard County and throughout the state to have a voice in how work force strategies are designed and implemented. These strategies are important to assure re tention of Kennedys skilled workers a nd prepare them for the future. Andra Cornelius is Workforce F loridas vice president of Business and Workforce Development Oppor tunities. She said the organization is d elighted to welcome Hauer to the board, especially because aerospace is and will be a critical area of focus. We believe his input will be i nvaluable given the imminent space shuttle to Constellation transition and Workforce Floridas focus on re taining shuttle workers in the states a erospace industry, and transitioning those who arent retained into other in-state, high-value industries, Cornelius said. Hauer said he will work closely w ith Kennedy, local aerospace con tractors and the BWDB, to be sure a ll needs are heard and appropriately acted upon. The BWDB is the space coasts l ocal arm of Workforce Florida. Its mission is to facilitate and be the catalyst for work force development activities that are responsive to the employment and training needs of Brevard County. The board includes volunteers who represent key indus try sectors, economic development a nd education. BWDB President Lisa Rice said H auer has been very active with the Aerospace Career Development Council that the organization formed more than a year ago. When the Workforce Florida b oard needed an aerospace represen tative I quickly recommended Hauer a s a person who would understand the need for growing world-class talent in Florida and especially in our local region, Rice said. The Space Act Agreement s igned by Kennedy and the BWDB in June was the foundation docu ment used by both organizations to p artner with state and local com munity leaders in the joint goal of p reparing Brevard Countys highly skilled work force for the transition. The agreement offers the work f orce opportunities for lifelong learning and job training. It also allows for increased availability of the Brevard Job Link Express bus at various locations around the center. Kennedys Human Resources D irector Tracy Anania serves as an force board. The Brevard Job Link Express bus makes stops at various locations around Kennedy Space Center.for NASATraining is given around Kennedy aboard the Brevard Job Link Express Bus that has several computer work stations. Workforce Florida aims to bolster support for Kennedy Space Centers work force during the transition from the Space Shuttle Program to the Constellation Program.We set sail on this new sea because there is new knowledge to be gained and new rights to be won, and they must be won and used for all people . . In 1962, John F. Kennedy d eclared the need for space explora tion. Fifty years after its conception, N ASAs accomplishments are a prominent presence in history. In celebration of NASAs 50th Anniversary Kennedy Space Center Visitor Complex is hosting a live, festival-style concert series. For three Saturdays, beginning Oct. 18, the symbolic Rocket Garden will provide the backdrop for the music icons. Reminiscent of the 1980s and the movie Rocky III, the popular rock band Survivor will kick of f the celebration with their hits like Eye of the Tiger and Is This Love. band to have a number one hit in the United States, The Guess Who earned its recognition in 1970 with the song Raindrops Keep Fallin on My Head. The band will appear on Oct. 25, performing its other wellknown songs such as American Woman and These Eyes. Topping off the series on form his famous 1980s pop-rock song Don t Walk Away and his Grammy Award-winning single Jessies Girl. Following the concert series events, the second annual Space and Air Show at Kennedy Space Center will be Nov 8 and 9. The show will feature the precision and power of the world famous U.S. Navy Blue Angels. All of the events are free with a Commander s Club annual pass.for NASABy Kate Frakes Spaceport News For more information or to purchase tickets, call (321) 449-4400 or visit www.kennedyspace center.com. Want to go? Page 7SPACEPORT NEWSSept. 5, 2008Satcom 2R among 1983s great run Remembering Our Heritage By Kay Grinter Reference Librarian The solid state RCA Satcom 2R satellite is positioned in a thermal vacuum chamber for simulated environment tests in Princeton, N.J. The satellite, which replaced Satcom 2 in 1976, was launched among the four space shuttle missions and 11 expendable vehicle launches in 1983.The year 1983, was a very good one for NASA. Four space shuttle missions and 11 ex pendable vehicle launches w e re accomplished with no failures. Every launch was a success. In May, President Ronald Reagan announced that the U.S. government would facilitate the commercial operation of the expendable launch vehicle program. The increased commercial use of NASAs services conformed to this policy. NASA alum Wayne McCall was chief of the Delta operations division in Kennedy Space Centers expendable launch vehicle operations in 1983 and recalled: Eight of those 11 unmanned launches were on Delta vehicles, and all were from Launch Complex 17 on Cape Canaveral Air Force Station. Since there were two active Delta pads, there was no dead time. We kept the crew busy on both pads every day because while mechanical work was under way on one vehicle, systems work could be done on the other. The normal eight-week vehicle between launches from a single pad could be reduced to four to six weeks. Among the commercial satellites launched atop McDonnell Douglas-built Delta vehicles (167 and 172) were Satcom 1R and RCAs series of advanced, second-generation domestic communications satellites. Satcom 1R launched April 11, with Satcom 2R on Sept. 8. After deployment, the Satcoms operated from geostationary circular orbit. Geostationary satellites hover over an assigned location above the equator, at an altitude of 22,240 miles. They are spaced around a circle some 165,000 miles in circumference. The advantages of this orbit are that the location is high enough to permit coverage of vast areas of the globe below, and the position can be maintained with minimal expenditure of on-board propellants. antennas on the ground must be carefully aimed at the satellite for good signal reception, it is important that it be locked in to its position. One of the major services of the Satcom system was the relay of television signals, and used by U.S. broadcast television networks such as ABC, NBC and CBS to distribute programming to end of 1978, there were 375 ground stations in the U.S. capable of transmitting and receiving satellite signals. This grew to 1,400 in 1979, and 3,000 by the end of 1980. Satcom 2R joined four other communications satellites in orbit RCA-C through RCA-F making network that provided coverage to all 50 states. More than 4,000 ground stations had direct access to these communications satellites, which all carried 28 completely solid state 24 operating channels for television, voice and highspeed data transmission. This was a 50 percent increase capacity compared to earlier Satcoms. The advanced Satcoms solid-state communications system. The advantages of were higher reliability, much simpler power supply requirements and improved performance characteristics. Earlier RCA Satcoms used traveling wave tube throughout the industry. Satcom 1R and 2R used hydrazine resistojets for stationkeeping and orbit maintenance. Resistojets operate directly from spacecraft batteries or use rudimentary power processing. They are appropriate for spacecraft on which but low thrust, is required. The resistojets on these advanced Satcoms had a coiled wire heater that radiated to an annular heat exchanger surrounding the coil. General Electric acquired RCA in 1986. The last Satcom satellite was placed in orbit in November 1985 and deactivated in February 2002. John F. Kennedy Space CenterManaging editor . . . . . . . . . . . . . . . . . . Candrea Thomas Editor . . . . . . . . . . . . . . . . . . . . Frank Ochoa-Gonzales Copy editor . . . . . . . . . . . . . . . . . . . . Rebecca SpragueEditorial support provided by InDyne, Inc. Writers Group.NASA at KSC is on the Internet at www.nasa.gov/kennedy USGPO: 733-049/600142Spaceport News is published on alternate Fridays by External Relations in the interest of KSC civil service and contractor employees. Contributions are welcome and should be submitted before publication to the Media Services Branch, IDI-011. 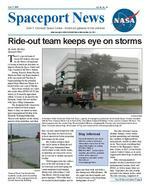 E-mail submissions can be sent to KSC-Spaceport-News@mail.nasa.gov Page 8SPACEPORT NEWSSept. 5, 2008 Send photos of yourself and/or your co-workers in action for possible publication. Photos should include a short caption, with names and job titles, from left. Send them to KSC-Spaceport-News@mail.nasa.gov Im a California girl and Id take an earthquake any day. We just took our shutters down. What do you think about the rash of storms that are headed our way?Its part of living in Florida. You just have to be prepared and get essentials ready. I really dont mind . its a little exciting. We just usually prepare for them. At home I maintain a box to keep important It just slows down the guys working on Constellation. Theres not much you can do. WORD STREETON THE at the O&C at e id t d Scheduled for Jan. 26, 2010 Launch/CCAFS: Atlas V, SDO; TBD Launch/KSC: Atlantis, STS-125; 1:34 a.m. No earlier than Feb. 10, 2009 Target Oct. 8 Launch/CCAFS: Delta IV, GOES-O; TBD Target Nov. 10 Launch/KSC: Endeavour, STS-126; 9:31 p.m. No earlier than March 2, 2009 Launch/CCAFS: Atlas V, LRO/LCROSS; TBD No earlier than Jan. 23, 2009 Launch/CCAFS: Delta II, STSS; TBD Target Feb. 12, 2009 Launch/KSC: Discovery, STS-119; 7:36 a.m. Scheduled for April 10 Launch/CCAFS: Delta II, Kepler; TBD Target May 15, 2009 Launch/KSC: Endeavour, STS-127; 4:52 p.m. Launch/KSC: Atlantis, STS-128; TBD Target July 30, 2009 Family Day at Kennedy Space Center Oct. 18 No earlier than Sept. 26 Launch/CCAFS: Delta IV, NROL-26; TBD Target Oct. 15, 2009 Launch/KSC: Discovery, STS-129; TBD Target Dec. 10, 2009 Launch/KSC: Endeavour, STS-130; TBD Target Feb. 11, 2010 Launch/KSC: Atlantis, STS-131; TBD Target April 8, 2010 Launch/KSC: Discovery, STS-132; TBD Target May 31, 2010 Launch/KSC: Endeavour, STS-133; TBDFrom Ride-out team Page 1 Do you have a topic of interest to NASA program and project management stakeholders? Deadline for abstract submissions is Sept. 12. For more information, go to: many different skill mixes, may be required to respond and take immediate action to deal with criti hardware, payloads or facilities, as weather permits. NASA, United Space Alli ance, Boeing and other contractors stationed in the EOC follow the and communicate with the leads in each facility as well as Brevard County Emergency Management and Patrick Air Force Base. After a storm passes, the ride-out team waits for the weather-safe an nouncement from the EOC before proceeding outside for initial as sessments. This only happens when winds in excess of 58 mph have subsided for a sustained period of least two hours or more. The ride-out crew are the spe cial people who volunteer their tim to make sure the center is safe and then, after the storm is over, are pre pared to come back in and get back t o supporting NASAs mission, sa John Cosat, Space Gateway Suppor emergency management chief. As of presstime, Tropical Storm H anna had delayed the rollout of space shuttle Atlantis to Launch Pa 39A. If Hanna stays on track, then Atlantis will roll to the pad, most likely Saturday morning. Two other tropical storms, Ike a nd Josephine, were churning in the Atlantic Ocean.